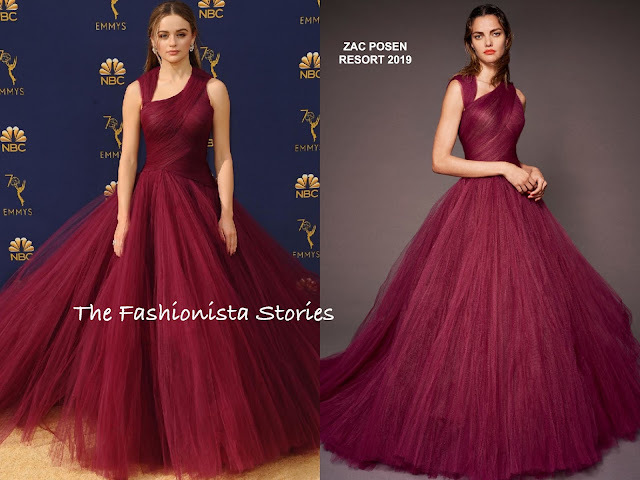 Joey King made somewhat of an dramatic entrance on the carpet for the 70th Primetime Emmy Awards at the Microsoft Theater on Monday(September 17th) in LA. If Joey wanted to gave us a memorable look, she did just that wearing a ZAC POSEN RESORT 2019 bordeaux tulle gown. Her layered gown which featured an asymmetrical neckline, may gave you deja vu but it is certainly her best look for the young actress. Joey dressed up her look with NEIL LANE earrings, which topped off her look along with a half-up half-down hairstyle with tendrils. What do you think of Joey's ball gown moment?